(MENAFN - Zion Market Research) Zion Market Research has published a new report titled 'Cadmium Telluride Photovoltaic Market by Application (Residential, Commercial, and Industrial & Utility): Global Industry Perspective, Comprehensive Analysis, and Forecast, 20182025. According to the report, global cadmium telluride photovoltaic market was valued at USD 6.07 billion in 2018 and is expected to reach USD 13.84 billion by 2025, at a CAGR of 12.5% between 2019 and 2025. Cadmium telluride photovoltaic is a device that produces electricity from light by using a cadmium telluride thin-film. In a multi-kilowatt system, cadmium telluride photovoltaic is the only thin-film technology that is inexpensive than any other conventional solar cells made of crystalline silicon. These types of photovoltaic are widely used in commercial and residential applications globally. The global cadmium telluride photovoltaic market is expected to grow considerably over the forecast time period, owing to favorable government initiatives to promote the adoption of renewable energy across the world. Moreover, the growing adoption of cadmium telluride photovoltaic in various countries is likely to have a major impact on the global cadmium telluride photovoltaic market in the years ahead. Furthermore, the rising energy consumption globally has further increased the demand for renewable sources of energy, which, in turn, is anticipated to propel the global cadmium telluride photovoltaic market growth in the future. Additionally, in several countries, such as the U.S., UK, and China, the demand for energy efficient buildings is increasing, which is anticipated to further fuel the cadmium telluride photovoltaic market growth in the future. However, the high manufacturing cost and the complexity of technology might restrain the expansion of the cadmium telluride photovoltaic market in the future. On the other hand, the increasing research and development and technological advancements related to cadmium telluride photovoltaic are projected to offer lucrative growth opportunities in the cadmium telluride photovoltaic market. The global cadmium telluride photovoltaic market is segmented on the basis of the application. The application segment of the global cadmium telluride photovoltaic includes residential, commercial, and industrial and utility. The commercial segment of the cadmium telluride photovoltaic market is projected to grow rapidly in the upcoming years. Moreover, in 2018, the residential application segment of the cadmium telluride photovoltaic market globally held the largest market share and is projected to dominate the market in the future. This can be attributed to the rising awareness regarding the cost-efficient energy and the growing demand for cadmium telluride photovoltaic. By region, the global cadmium telluride photovoltaic market is segmented into North America, Europe, Asia Pacific, Latin America, and the Middle East and Africa. In 2018, the European cadmium telluride photovoltaic regional market dominated the global market and held the largest share. The region is projected to maintain its dominance in the future as well, owing to the rising demand for efficient energy in commercial and residential sectors. The Middle East and Africa and Latin America are expected to be the fastest growing regions over the estimated timeframe due to the growing demand for cadmium telluride photovoltaic for residential applications. Additionally, the rapid industrialization witnessed in Latin America has further increased the demand for renewable energy, which is likely to propel this region's cadmium telluride photovoltaic market growth over the estimated timeline. 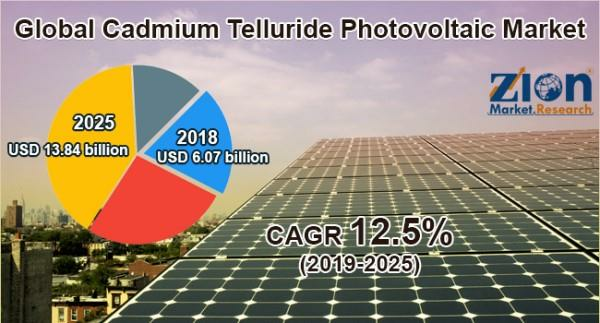 Some key manufacturers of the global cadmium telluride photovoltaic market include First Solar, Advanced Solar Power, Antec Solar, Calyxo, CNBM (Chengdu) Optoelectronic Materials, CTF Solar, D2solar, Dmsolar, RSI, UPT Solar, and Willard & Kelsey (WK) Solar, among others. Zion Market Research is an obligated company. We create futuristic, cutting-edge, informative reports ranging from industry reports, the company reports to country reports. We provide our clients not only with market statistics unveiled by avowed private publishers and public organizations but also with vogue and newest industry reports along with pre-eminent and niche company profiles. Our database of market research reports comprises a wide variety of reports from cardinal industries. Our database is been updated constantly in order to fulfill our clients with prompt and direct online access to our database. Keeping in mind the client's needs, we have included expert insights on global industries, products, and market trends in this database. Last but not the least, we make it our duty to ensure the success of clients connected to us—after all—if you do well, a little of the light shines on us.